Arabic is a widely-spoken language with a long and rich history, but existing corpora and language technology focus mostly on modern Arabic and its varieties. Therefore, studying the history of the language has so far been mostly limited to manual analyses on a small scale. In this work, we present a large-scale historical corpus of the written Arabic language, spanning 1400 years. We describe our efforts to clean and process this corpus using Arabic NLP tools, including the identification of reused text. We study the history of the Arabic language using a novel automatic periodization algorithm, as well as other techniques. Our findings confirm the established division of written Arabic into Modern Standard and Classical Arabic, and confirm other established periodizations, while suggesting that written Arabic may be divisible into still further periods of development. Yonatan Belinkov and Alexander Magidow have contributed equally to this work. This research was partly supported by the HBKU Qatar Computing Research Institute (QCRI), as part of a collaboration with the MIT Computer Science and Artificial Intelligence Laboratory (CSAIL). Y.B. was also supported by the Harvard Mind, Brain, Behavior Initiative. This research was also partly supported by the Israel Science Foundation (Grant No. 977/16), and by DICTA: The Israel Center For Text Analysis. Boiler Plate Matches The following examples illustrate the boilerplate passages identified in the first step of the text reuse algorithm (Sect. 5). The first is a chain of transmission that occurs 2747 times in the corpus. The second is a part of a Hadith that occurs 221 times. My search for knowledge is not greed to reach its utmost, or to seize its aim. Rather, I seek something of which ignorance is widespread, and which the wise dare not contradict. My search for knowledge is not greed to reach its end, or to seize its aim. Rather, knowledge of that of which ignorance is widespread and which the wise dare not contradict. Abdelali, A., Darwish, K., Durrani, N., & Mubarak, H. (2016). Farasa: A fast and furious segmenter for Arabic. In Proceedings of the 2016 conference of the North American chapter of the association for computational linguistics: Demonstrations (pp. 11–16). Association for Computational Linguistics, http://aclanthology.coli.uni-saarland.de/pdf/N/N16/N16-3003.pdf. https://doi.org/10.18653/v1/N16-3003. Accessed 11 Apr 2019. Basile, C., Benedetto, D., Caglioti, G., Degli & Esposti, M. (2009). A plagiarism detection procedure in three steps: Selection, matches and squares. In B. Stein, P. Rosso, E. Stamatatos, M. Koppel, & E. Agirre (Eds. ), SEPLN 2009 workshop on uncovering plagiarism, authorship, and social software misuse (PAN 2009) (Vol. 502, pp. 19–23). CEUR-WS.org, San Sebastian, Spain, http://ceur-ws.org/Vol-502. Accessed 11 Apr 2019. Darwish, K., Abdelali, A., & Mubarak, H. (2014). Using stem-templates to improve Arabic POS and gender/number tagging. 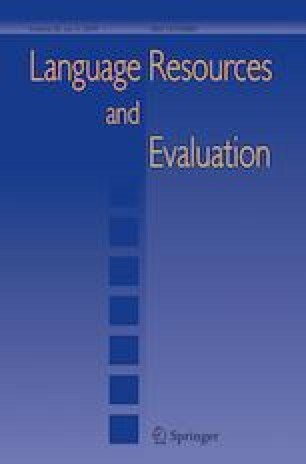 In Proceedings of the 9th international conference on language resources and evaluation (LREC’14), LREC 2014 (pp. 2926–2931). European Language Resources Association (ELRA), http://www.lrec-conf.org/proceedings/lrec2014/pdf/335_Paper.pdf. Accessed 11 Apr 2019. Darwish, K., Mubarak, H., Abdelali, A., & Eldesouki, M. (2017). Arabic POS tagging: Don’t abandon feature engineering just yet. In Proceedings of the 3rd Arabic natural language processing workshop (pp. 130–137). Association for Computational Linguistics, http://aclweb.org/anthology/W17-1316. Accessed 11 Apr 2019. Davies, M. (2010). The corpus of historical American English: 400 million words, 1810–2009, http://corpus.byu.edu/coha. Accessed 11 Apr 2019. Hamilton, W. L., Leskovec, J., & Jurafsky, D. (2016). Diachronic word embeddings reveal statistical laws of semantic change. In Proceedings of the 54th annual meeting of the association for computational linguistics (Vol. 1: Long Papers, pp. 1489–1501). Association for Computational Linguistics, http://aclanthology.coli.uni-saarland.de/pdf/P/P16/P16-1141.pdf. https://doi.org/10.18653/v1/P16-1141. Kim, Y., Chiu, Y. I., Hanaki, K., Hegde, D., & Petrov, S. (2014). Temporal analysis of language through neural language models. In Proceedings of the ACL 2014 workshop on language technologies and computational social science (pp. 61–65). Baltimore, MD, USA: Association for Computational Linguistics, http://www.aclweb.org/anthology/W14-2517. Accessed 11 Apr 2019. Mikolov, T., Chen, K., Corrado, G., & Dean, J. (2013a). Efficient estimation of word representations in vector space. CoRR abs/1301.3781. http://arxiv.org/abs/1301.3781. Accessed 11 Apr 2019. Mikolov, T., Sutskever, I., Chen, K., Corrado, G., & Dean, J. (2013b). Distributed representations of words and phrases and their compositionality. CoRR abs/1310.4546. http://arxiv.org/abs/1310.4546. Accessed 11 Apr 2019. Mikolov, T., Yih, W., & Zweig, G. (2013c). Linguistic regularities in continuous space word representations. In Proceedings of the 2013 conference of the North American Chapter of the association for computational linguistics: Human language technologies (NAACL-HLT-2013). Association for Computational Linguistics, http://research.microsoft.com/apps/pubs/default.aspx?id=189726. Accessed 11 Apr 2019. Mikolov, T., Yih, W., & Zweig, G. (2013d). Linguistic regularities in continuous space word representations. In Human language technologies: Conference of the North American chapter of the association of computational linguistics, proceedings, June 9–14, 2013 (pp. 746–751). Atlanta, Georgia, USA: Westin Peachtree Plaza Hotel, http://aclweb.org/anthology/N/N13/N13-1090.pdf. Accessed 11 Apr 2019. Niculae, V., Zampieri, M., Dinu, L., & Ciobanu, A. M. (2014). Temporal text ranking and automatic dating of texts. In Proceedings of the 14th conference of the European chapter of the association for computational linguistics, Gothenburg, Sweden (Vol. 2: Short Papers, pp. 17–21), http://www.aclweb.org/anthology/E14-4004. Accessed 11 Apr 2019. Pasha, A., Al-Badrashiny, M., Diab, M., Kholy, A. E., Eskander, R., Habash, N., et al. (2014). MADAMIRA: A fast, comprehensive tool for morphological analysis and disambiguation of Arabic. In Proceedings of the 9th international conference on language resources and evaluation (LREC’14), Reykjavik, Iceland (pp. 1094–1101), http://www.lrec-conf.org/proceedings/lrec2014/pdf/593_Paper.pdf. Accessed 11 Apr 2019. Popescu, O., & Strapparava, C. (2015). SemEval 2015, Task 7: Diachronic text evaluation. In Proceedings of the 9th international workshop on semantic evaluation (SemEval 2015), Denver, Colorado (pp. 870–878), http://www.aclweb.org/anthology/S15-2147. Accessed 11 Apr 2019. Romanov, M., Miller, M. T., & Savant, S. B. (2017–ongoing). OpenITI—machine-actionable scholarly corpus of premodern Islamicate texts, https://openiti.github.io. Accessed 11 Apr 2019. Scherbinin, V., & Butakov, S. (2009). Using Microsoft SQL server platform for plagiarism detection. In B. Stein, P. Rosso, E. Stamatatos, M. Koppel, & E. Agirre (Eds. ), SEPLN 2009 workshop on uncovering plagiarism, authorship, and social software misuse (PAN 2009) (Vol. 502). CEUR-WS.org, San Sebastian, Spain, http://ceur-ws.org/Vol-502. Accessed 11 Apr 2019. Schneider, N., Mohit, B., Oflazer, K., & Smith, N. A. (2012). Coarse lexical semantic annotation with supersenses: An Arabic case study. In Proceedings of the 50th annual meeting of the association for computational linguistics: Short Papers, ACL’12 (Vol. 2 , pp. 253–258). Stroudsburg, PA: Association for Computational Linguistics, http://dl.acm.org/citation.cfm?id=2390665.2390726. Accessed 11 Apr 2019. Shmidman, A., Koppel, M., & Porat, E. (2016). Identification of parallel passages across a large hebrew/aramaic corpus. arXiv preprint arXiv:1602.08715. Shoufan, A., & Alameri, S. (2015). Natural language processing for dialectical Arabic: A survey. In Proceedings of the 2nd workshop on Arabic natural language processing, Beijing, China (pp. 36–48), http://www.aclweb.org/anthology/W15-3205. Accessed 11 Apr 2019. Smith, D. A., Cordell, R., Dillon, E. M., Stramp, N., & Wilkerson, J. (2014). Detecting and modeling local text reuse. In Proceedings of the 14th ACM/IEEE-CS joint conference on digital libraries, JCDL’14, London, UK (pp. 183–192), http://dl.acm.org/citation.cfm?id=2740769.2740800. Accessed 11 Apr 2019. Stein, B., Rosso, P., Stamatatos, E., Koppel, M., & Agirre, E. (Eds.). (2009). SEPLN 2009 workshop on uncovering plagiarism, authorship, and social software misuse (PAN 2009) (Vol. 502). CEUR-WS.org, San Sebastian, Spain, http://ceur-ws.org/Vol-502. Accessed 11 Apr 2019. Wijaya, D. T., & Yeniterzi, R. (2011). Understanding semantic change of words over centuries. In Proceedings of the 2011 international workshop on detecting and exploiting cultural diversity on the social web—DETECT’11 (p. 35), http://dl.acm.org/citation.cfm?doid=2064448.2064475. https://doi.org/10.1145/2064448.2064475. Accessed 11 Apr 2019. Zemánek, P., & Milička, J. (2014b). Quotations, relevance and time depth: Medieval Arabic literature in grids and networks. In Proceedings of the 3rd workshop on computational linguistics for literature (CLFL), Gothenburg, Sweden (pp. 17–24), http://www.aclweb.org/anthology/W14-0903. Accessed 11 Apr 2019.